St. Barth’s regulars who are ‘in the know’ have three things they absolutely must do during their visit to the fashionable destination: Pick up food to go at Mayas for a picnic in Colombier or Saline; enjoy lunch and several bottles of rosé at La Plage and a visit to the Cheval Blanc Isle de France Hotel to purchase one of Katja’s latest creations. Coming home from St. Barth’s without a new signature leather and pearl piece is absolutely out of the question for many of us! Though Irma has made a dent in our plans this year to visit St. Barth’s, the good news is Katja Bentzen is coming to South Florida end of January and staying with me for a couple of weeks! Katja has been the exclusive supplier of exquisite pearl, mother of pearl and vermeil creations to the Cheval Blanc Isle de France (formerly Hotel Isle de France) for the last 15 years. Katja uses only the best pearls from Tahiti and the South Seas with AAA lustre and shine, which she personally selects during her regular trips to the islands. Katja imports the finest quality supple leather from Australia which she hand prepares for each piece she creates. 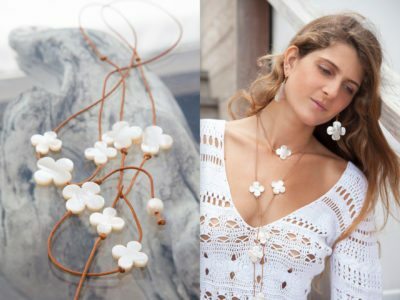 I thought I had died and gone to heaven when I visited Katja at her studio in St. Barth’s— a pearl lover’s paradise! My boyfriend spent close to two hours selecting the perfect shades of grey resulting in my favorite piece ever: the perfect Tahitian pearl and leather necklace. desire to go sailing and traveling was born. She was originally trained in London to restore antique kilims tapestry and it was here that her interest for jewelry and fashion blossomed. Katja spent her winters between the islands of St Barth’s and Antigua and summers in Newport RI, where she worked for the Restoration Society bringing rugs and tapestries back to life for the mansions on Ocean Drive. She used the knotting techniques for restoring these tapestries to create her pearl jewelry.Whilst sailing around the oceans Katja discovered the pearls from Tahiti and the South Seas and began using them to create the pearl jewelry that she is so renowned for today. She’s already been snapped up by Lourdes de Guardiola who will be showcasing select pieces at Milou’s pop up at International Polo Club from January 15-January 28 and February 5- 18th. Lourdes’s curated collection will include pieces from both Katja’s clover and vermeil lines. Pearl aficionados will also have the opportunity to meet Katja, select their favorite pearls and request a customized design tailored specifically for them. Other trunk shows in Wellington and Worth Avenue are still in the planning. For more information on trunk shows or for private appointments, join Milou’s mailing list or email me.